Are you frustrated and feeling guilty because you�re not spending enough time reading your Bible? Are you beginning to wonder if it�s even possible to be consistent in your Bible Study? Are you spending more time watching television or on the Internet than you are seeking God�s Word? Obviously, the more questions you answered �yes� to, the more you need help in Studying the Word of God. We use to try and read the Bible every day, but failed because... between the kids, our ministry and our businesses, we felt overwhelmed and just didn�t have time for the Lord. ...That overwhelming feeling can paralyze you and make you less productive. What if you could stop drifting from reading the Word of God � and start to enjoy a consistent and powerful Bible Study once again? By the time you finish reading this page, you�ll discover the secret that can change your life. Just as it has for hundreds of others who�ve experienced the pain and guilt of drifting from God. Let me tell you from my 14 years of being involved in ministry, that there is an easy way to learn how to integrate Bible Study into your daily life that will have you Studying God�s Word like never before. Each of our methods and techniques are delivered in bite-sized pieces so you won�t feel overwhelmed with information overload. How to turbocharge your Bible Study in the shortest time possible. It�s the quality - not quantity. How to shun the stunning lies of the enemy that he�s implanted in your thoughts. How to bust through the boredom whenever you�re studying the Bible. How to know God�s revelation to you every time you open your Bible. How to find a Bible Buddy to walk with you in your journey to knowing God�s Word better. This course will revolutionize the way you approach your Bible Study with powerful strategies that will give you that Bible Study breakthrough you�ve been looking for. Are you beginning to see the ways Bible Study For Busy People: The Simplest and Easiest Way To Study God�s Word can help you? Notice your excitement to Study your Bible has increased dramatically. You�re so into it while Studying the Bible that you didn�t notice how much time had passed. Maybe it's not the best-written book in the world, but Bible Study For Busy People: The Simplest and Easiest Way To Study God�s Word contains the strongest, easiest to learn and fastest techniques for your Bible Study success. NOTE: Please realize Bible Study For Busy People is a serious course about creating effective Bible Study and integrating it into your daily life� and it requires the same attitude from you. You also get an audio version of the book jam-packed with information for you to learn from when you�re �on-the-go�. Get the entire course on audio so that you can listen on the go� anytime, anywhere, 24/7 - while you do other things like: commuting to work, waiting to pick up your children from an activity, working out at the gym, exercising at home, doing household chores, jogging, walking, driving, mowing the lawn or doing other outside work, at night while your partner sleeps (you won't keep them awake by having a light on), and much, much more! 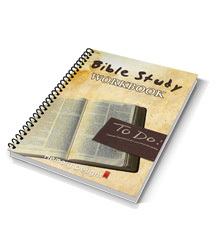 This actionable workbook will help you develop your personal system of Bible Study. With the help of this workbook, you�ll develop your own system that will fit perfectly into your daily schedule. You�ll get access to this great course instantly and begin Studying the Bible as soon as you download it. Let's do a quick comparison � You could pay hundreds or thousands to attend seminars with someone who may or may not truly understand Bible Study. 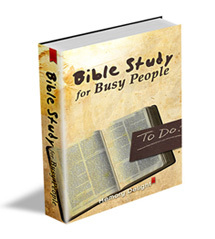 This sensational resource, Bible Study For Busy People: The Simplest and Easiest Way To Study God�s Word, is available to you as a downloadable manual (or ebook) as well as an audio version instantly accessible from the Internet. Since you're in a Bible Study bind just like we were, we�d really like to help you get into Bible Study the fastest way possible� So we all win! After studying and following our instructions in this powerful Bible Study course, if you are unsuccessful in doing Bible Study on a daily basis� simply show us proof of your efforts and we�ll gladly refund the full purchase price of this course. Purchase your copy today. Instantly download the PDF�s and audio content and listen to every recording, read every word, do the exercises in your workbook and apply everything you�ve learned� Right down to the very last day. If at any time during those first 2 months you�re NOT completely convinced that Bible Study For Busy People: The Simplest and Easiest Way To Study The Bible is worth the price of your purchase many times over, we want you to ask for your money back. We�ll refund you for the entire amount, on the spot. Just give us a call at 1.800.680.1119 or email us at [email protected] and we�ll give you a full refund. When you first receive Bible Study For Busy People and you start to go through it, you�ll get excited about the possibilities...and then, when you start to use them you think, "My goodness, this stuff really works!" 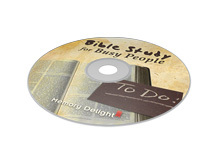 Yes Don and Dawn , I want to order Bible Study For Busy People: The Simplest and Easiest Way To Study The Bible and discover how I can easily practice Bible Study every day with this incredibly simple system! Everything you're about to learn is tried and tested material. This will apply to your Bible Study not just once, but for many years to come. It's an investment not just for today - but for the rest of your life. Remember, this is 100% risk free. If for any reason you don't believe that you got your moneys worth, just contact us, show us how you put these techniques into action and we'll give you a full refund. That's how confident we are that this really does work. From the moment you dive into Bible Study For Busy People: The Simplest and Easiest Way To Study The Bible, you'll feel great about increasing the effectiveness of your Bible Study � you will gain mastery in no time. Click here to receive your copy..